The frustrating thing about renovations, flipping houses and all thing construction is that it seems to take a frickin' frackin' backin' packin' ETERNITY to see the results. Usually just months, but still. The people want their AFTER pics! Hooray! I like. So fresh and so clean (clean). Let's back up and see the entire process from beginning to end. Here's the before in big picture glory. Most landlords would leave this as-is in this price range. All of the appliances worked. Everything was in good condition. Maybe a coat of paint on the walls, a cleaning and call it a day. Not me. I just CAN'T. There's a fine line between updating because an investment property and just renovating because I want it to be pretty. So, I started with an inspiration kitchen and took it from there. See the design board below. 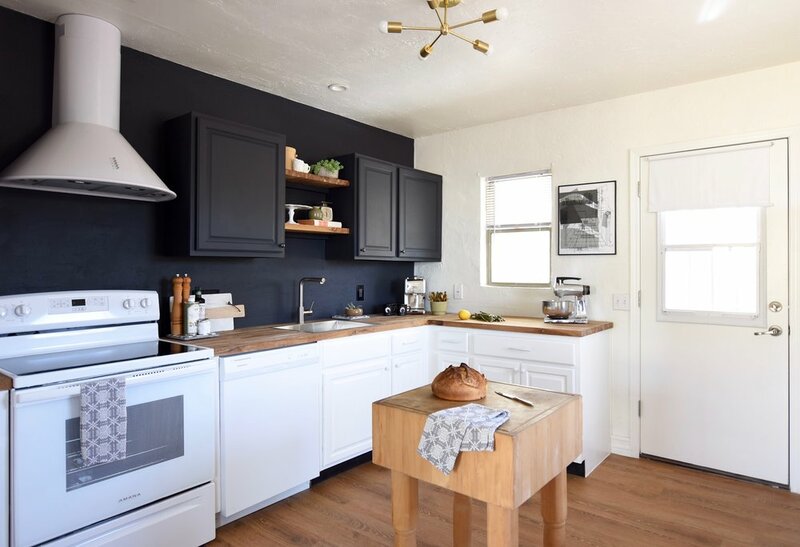 Thanks to A Lovely Lark for being making such an awesome kitchen to be inspired by! I wish I could have staged it with some funky vintage items , but I'm lucky I even got photos. This house was rented before we were even finished with it! A good problem to have....must not complain. Here is the real deal for your full sized viewing pleasure. Durable and can stand up to use and abuse over many years. Is something to be proud to rent to others. Is somewhere I would live. Many of these points are the OPPOSITE of most landlords. Durable and easy to clean are pretty standard, I think. I mean you'll get those people that don't care, they just want a body in there. For me, I want materials that will last. This is why I chose granite counters, a backsplash and to paint the cabinets white. These finishes are likely be in style for a while, are durable products and will clean up easily. The gray grout in the backsplash will stand up to staining over the years and the white cabinets can easily be painted over. 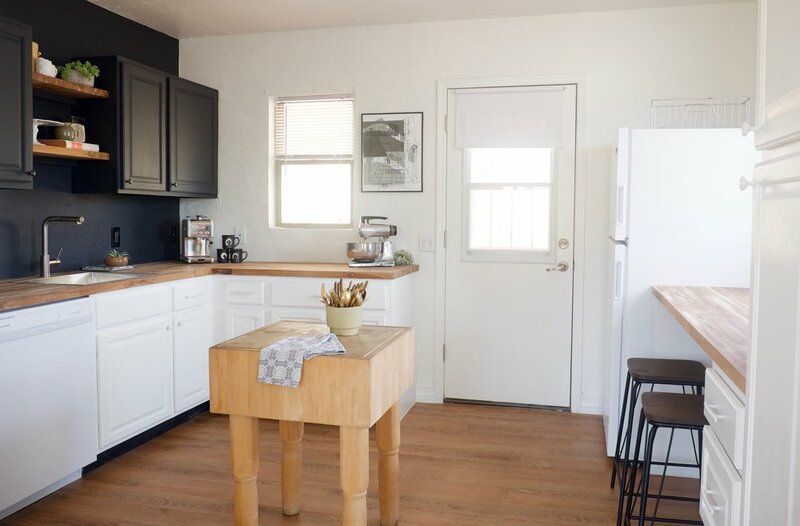 I wanted the space to also be pretty and different than other rental homes. Such a #girlboss. Who wants to live in a builder grade snoozefest? If the tenant thinks it is special, they will take better care of it. They may also stick around longer instead of looking for greener pastures. Things will go wrong, furnaces will quit at 8pm on a cold winter's night. That's owning a home. That happens. But, not offering something that you can be proud of is not for me. I want to know that my home is a great place to live. I want to feel comfortable living there. If I do then it's likely my tenants will, too. Pretty good for the transformation, in my opinion. Not only does it look better, I feel confident it will stand the test of time for years to come. If mint flavored base cabinets are no longer as yummy as they seem right now, then we can easily switch to the avocado or burnt orange colors of tomorrow!